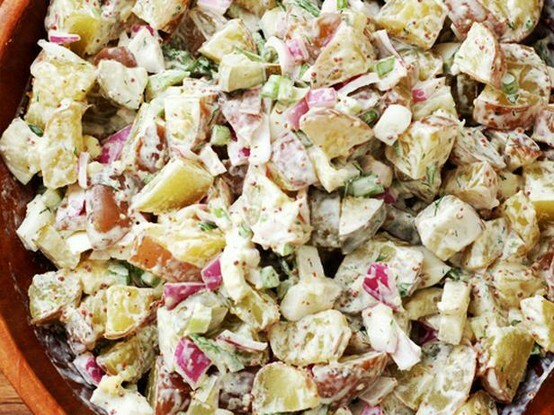 This recipe gained the title of "Best" Potato Salad courtesy of Pinterest, and the foodies in my home quickly agreed! 1. Cook potatoes in large pot of boiling salted water until tender, about 30 minutes. (You can check for doneness by pricking the potatoes with a fork. If the fork goes in fairly easily, then they're done.) Drain and cool slightly. 2. While they’re still warm, cut potatoes into chunks and transfer to a large bowl with the onion, pickle and celery. In a separate bowl, mix together the mayo, mustard, vinegar and dill, then pour the dressing over the potatoes. Season potato salad to taste with salt and pepper. Note: You can prepare the vegetables and dressing separately a day before and then combine an hour before serving.